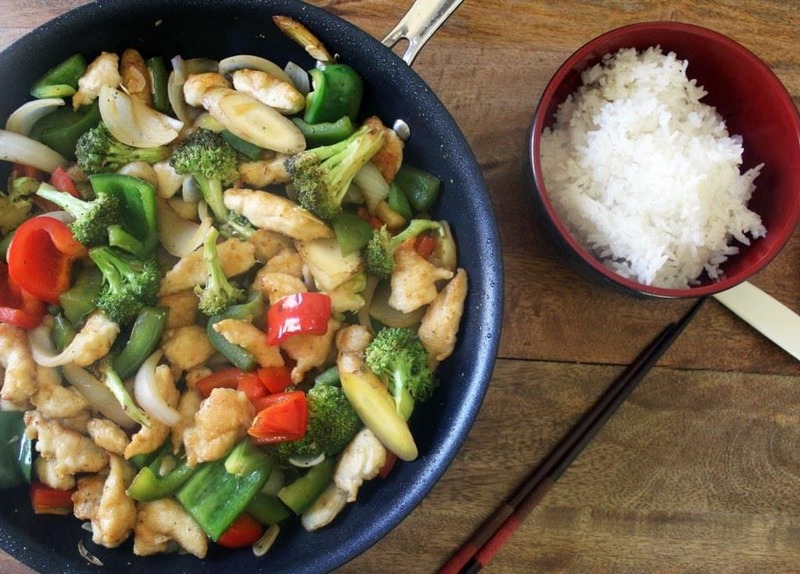 Let’s stir and fry. You need some kind of chicken, obviously. 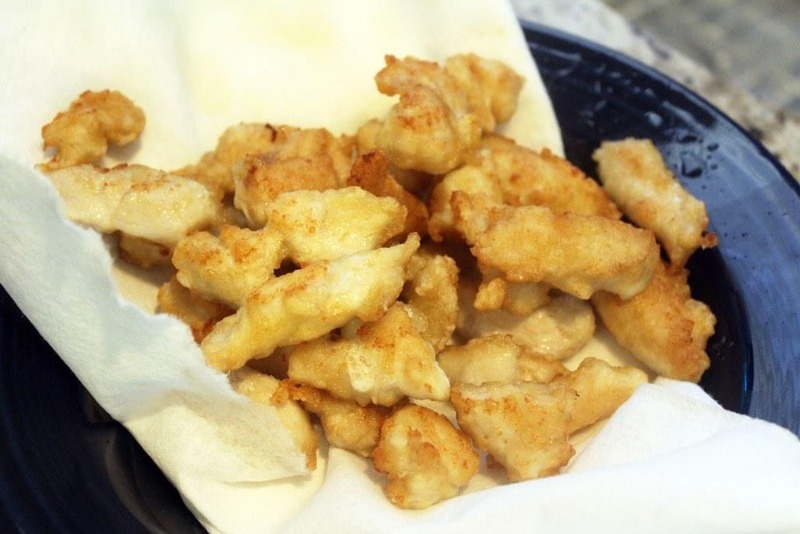 These are chicken tenders! You could use any boneless skinless chicken you like, though. Then, for the stir fry, you need garlic, ginger, an onion, and other veggies. Here I have peppers, carrots, and broccoli, but you could do mushrooms, zucchini, anything you like! 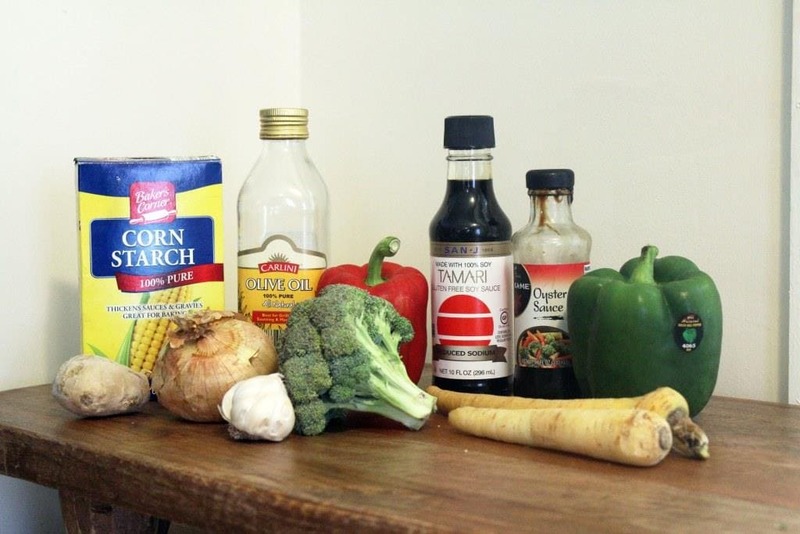 Then you need some kind of light oil for frying, soy sauce, and oyster sauce. Let’s start with the chicken. 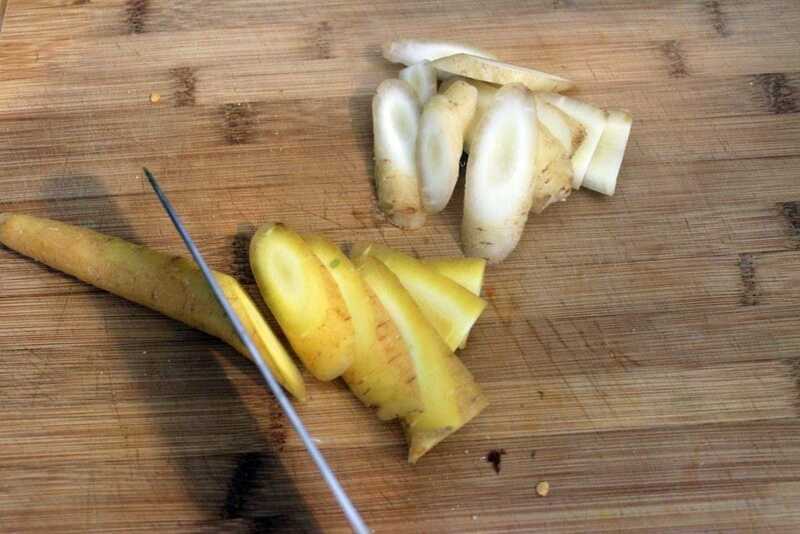 Cut it into little bite-sized pieces or strips. 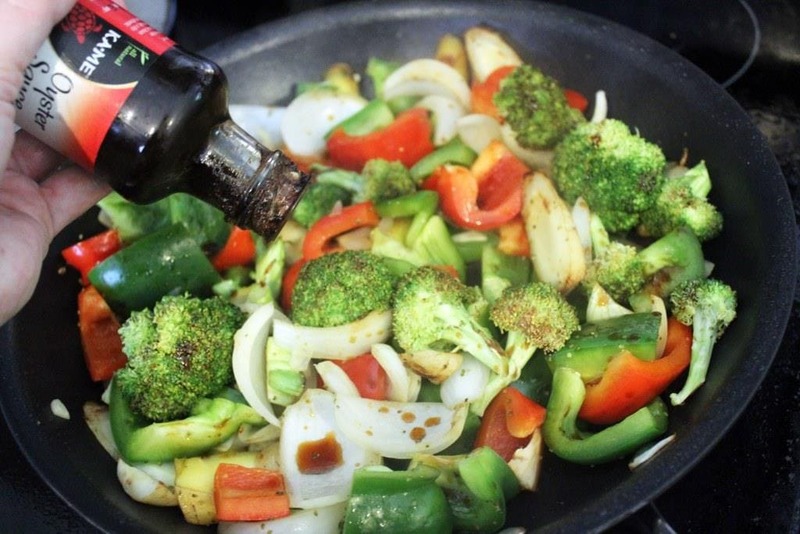 Make a thin layer of oil in a large skillet or wok, too, and turn it to medium-high. We want HOT oil. 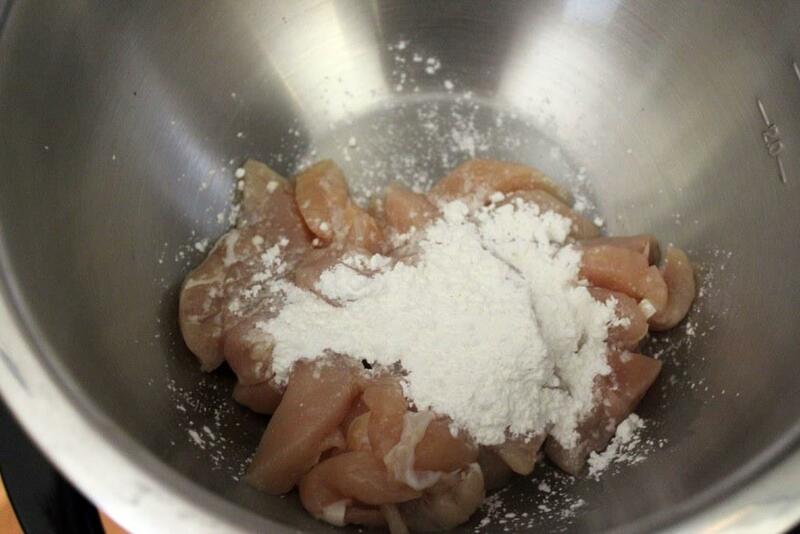 Then, dump some cornstarch over the chicken and stir it around to coat. It’ll be kind of gummy, but don’t let that deter you. Somehow the cornstarch mixed with chicken juices (gross, I know) forms a great crispy crust that you just don’t get with flour. 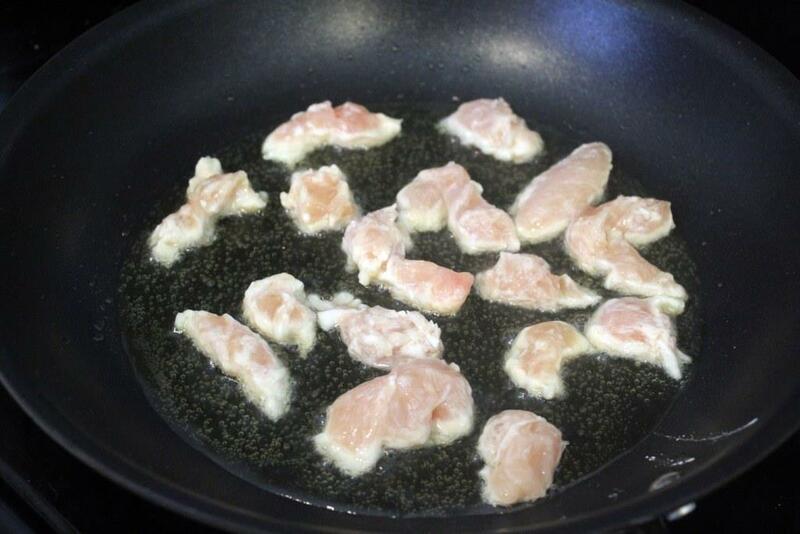 When the oil is very hot, place the chicken in one layer in the skillet. 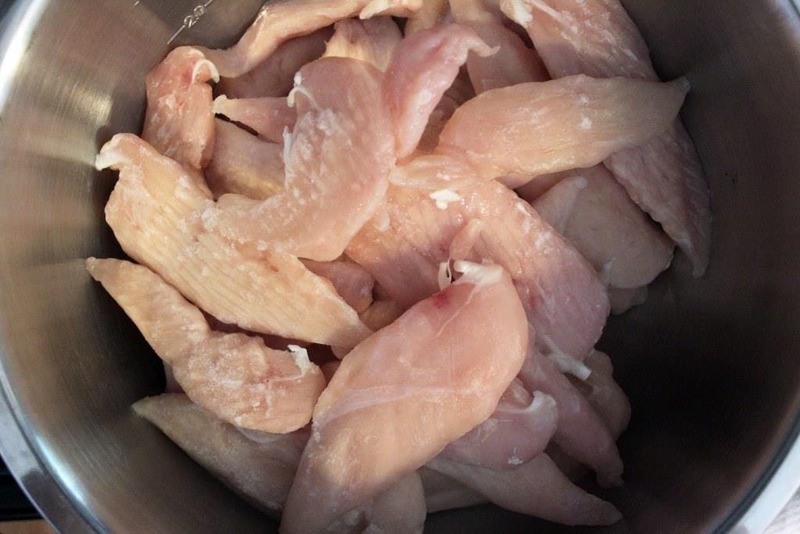 I had to do 3 batches of chicken – take time to separate the pieces and don’t crowd the pan. The chicken should sizzle! Let the chicken fry for about 3 minutes until the edges turn white, then flip it over and let it finish cooking for another 3 minutes on the second side. It’ll be golden but not brown. 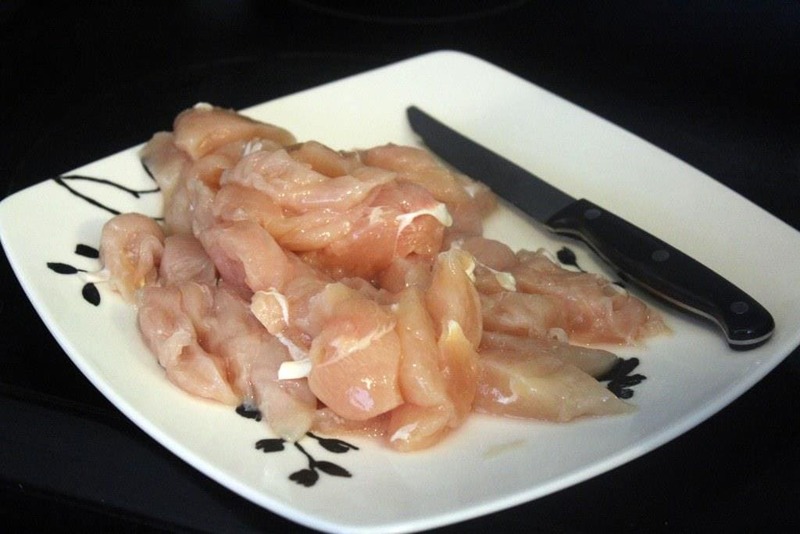 When the chicken is cooked through and crispy, remove it to a plate lined with paper towels to drain. Repeat if you need to until the chicken is all cooked. While the chicken is cooking, prep the veggies. 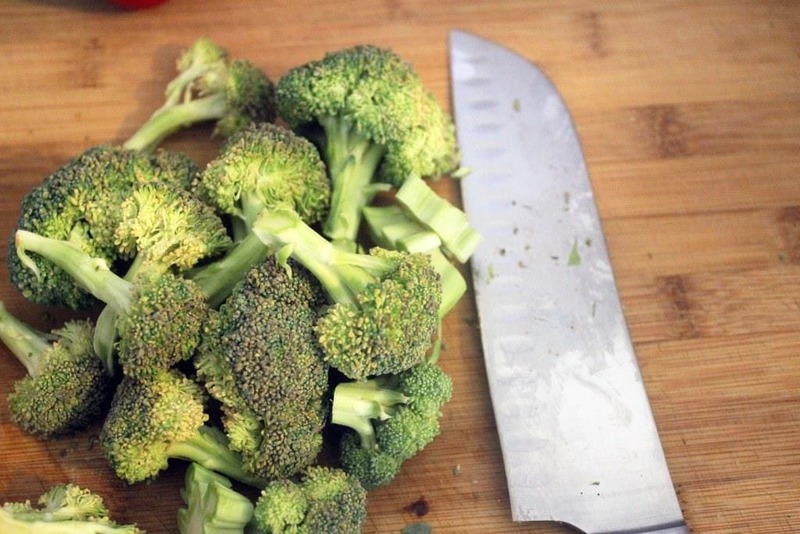 Cut the broccoli into bite-sized pieces. And thinly slice the carrots on a diagonal so they look pretty. 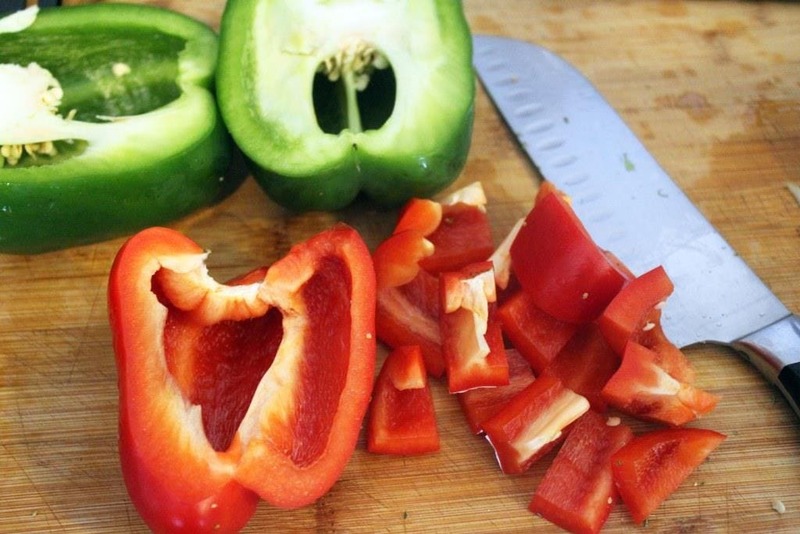 Cut the bell peppers into chunks, thinly slice the garlic, and slice the onion. 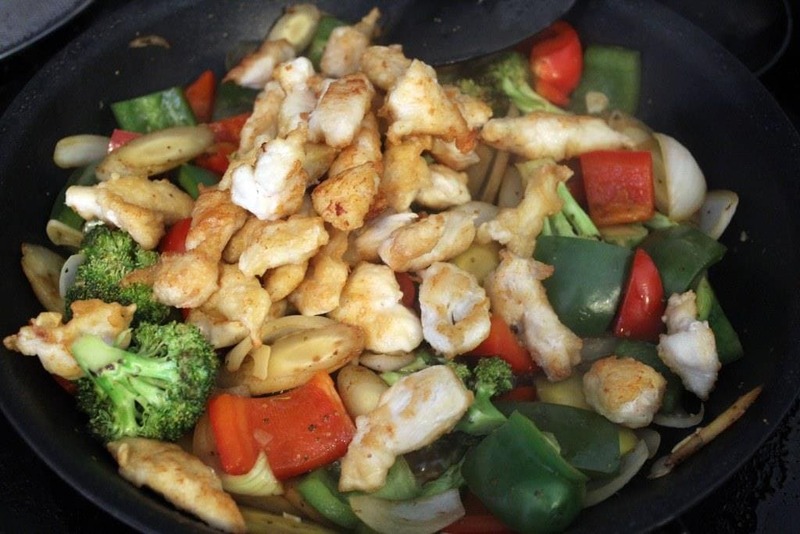 Now, when the chicken is all cooked and the veggies are prepped, we’ll use the same skillet to build the veggie mixture. If the skillet seems dry, add a bit more oil to the pan. Then, add the broccoli and carrots. 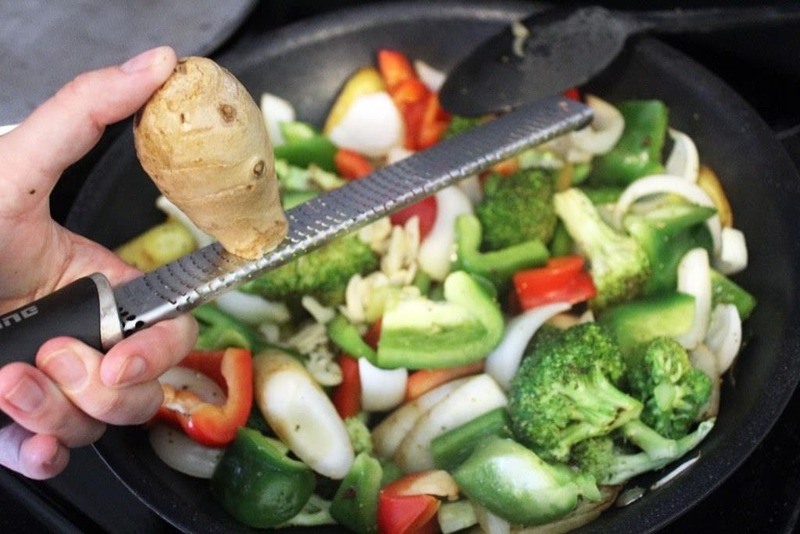 We start with the veggies that take the longest and end with the shortest cooking time ingredients so we don’t have some veggies that are mushy and some that are underdone. In theory. 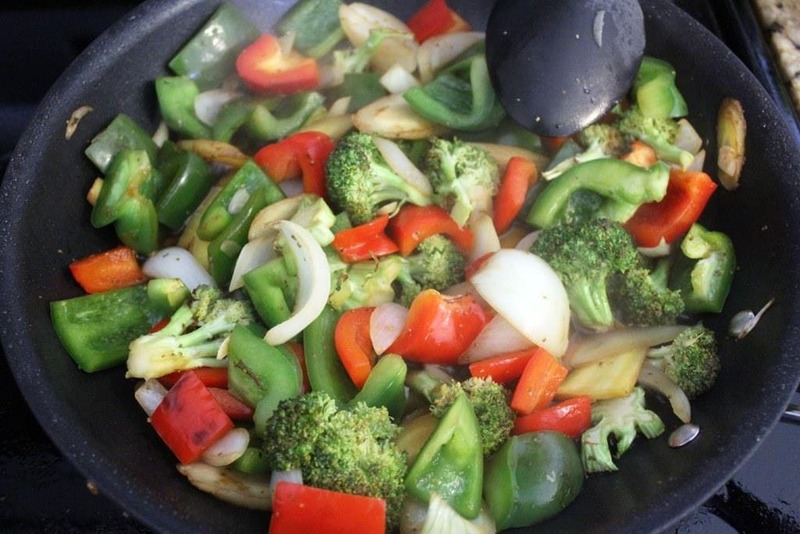 Let the carrots and broccoli cook for 2 minutes to soften just slightly, then add the peppers and onions. Stir those around, just until they start to soften. 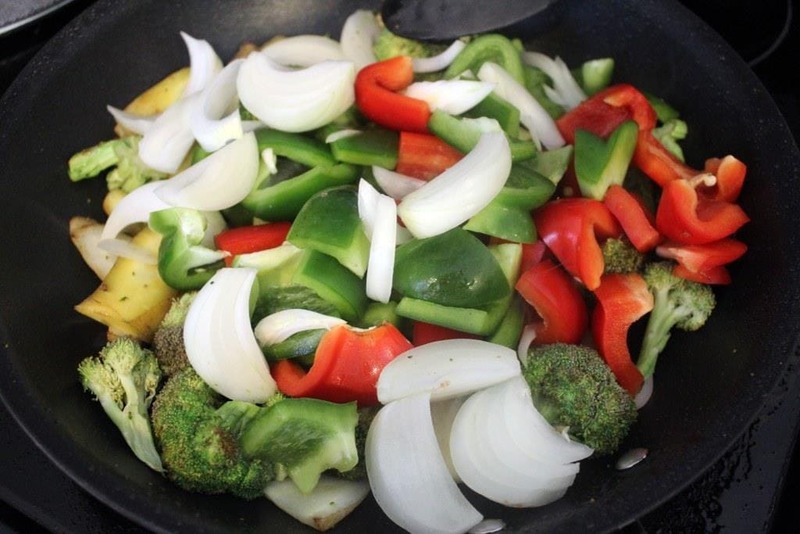 When the veggies have turned bright in color and are starting to cook a bit, add the garlic and ginger. 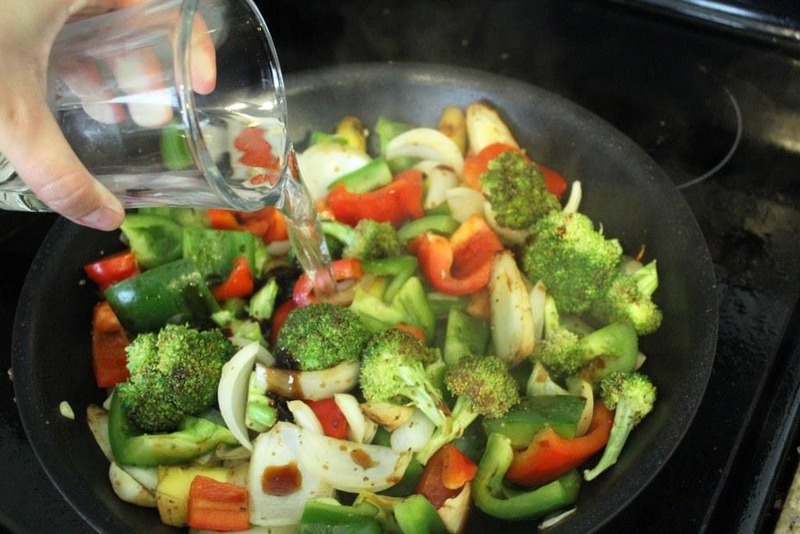 Stir THAT around, and let the veggies all cook together for 1 minute. Now, time for the sauce! Add the oyster sauce. Then the soy sauce and water. Stir everything once more, then taste the sauce: if you want more salt go for some more soy sauce. When the liquid has almost all reduced in the pan, add the chicken and toss it to warm through and coat in the sauce. Then, serve! Look how gorgeous this is. 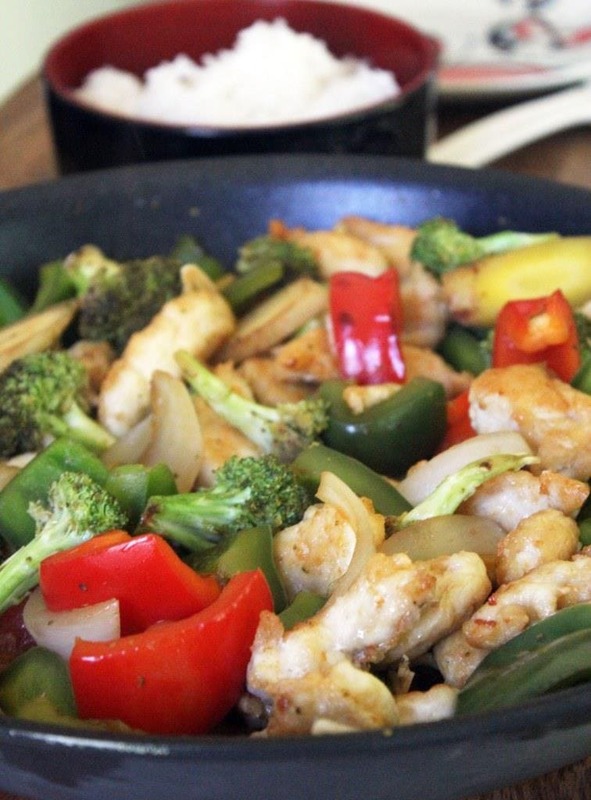 The key to a good stir fry is to not be concerned about cooking the veggies through. If they’re cooked through by the time you build the sauce they’ll be mushy when you actually serve, so we’re just cooking them a bit, then adding our sauce ingredients, then perfect! You could of course make this with seared chicken, but the crispy coating is super duper yummy with all the veggies we’ve got going on here. If you don’t have fresh ginger you can totally skip it; the oyster and soy sauces are what makes this taste very takeout-ish. 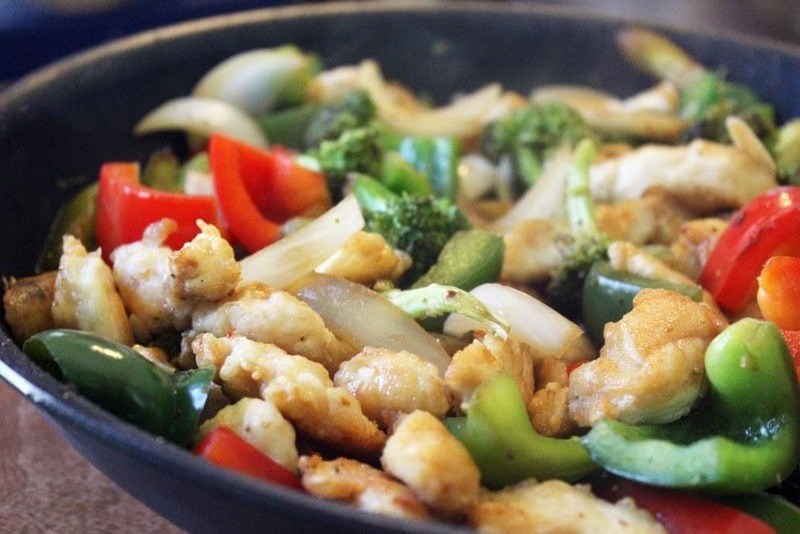 Add 1/4 inch oil to a large skillet or wok, preheat to medium-high heat. Meanwhile, cut the chicken into bite-sized pieces and sprinkle with the cornstarch. Stir to coat; the mixture will be gummy. When the oil is rippling and nearly smoking, add the chicken in one single layer and fry for 3 minutes on each side until browned and crispy. Remove to a plate lined with paper towels to drain. 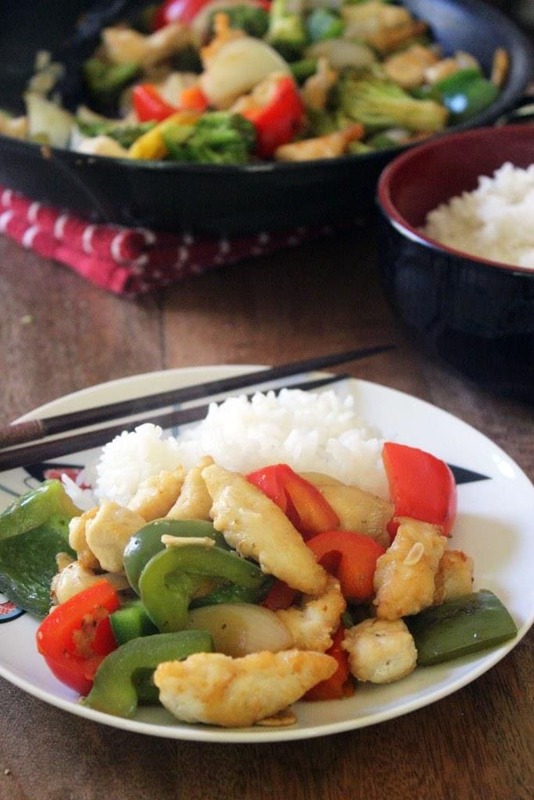 Repeat with any remaining chicken - don't crowd the pan and try to do it all at once. 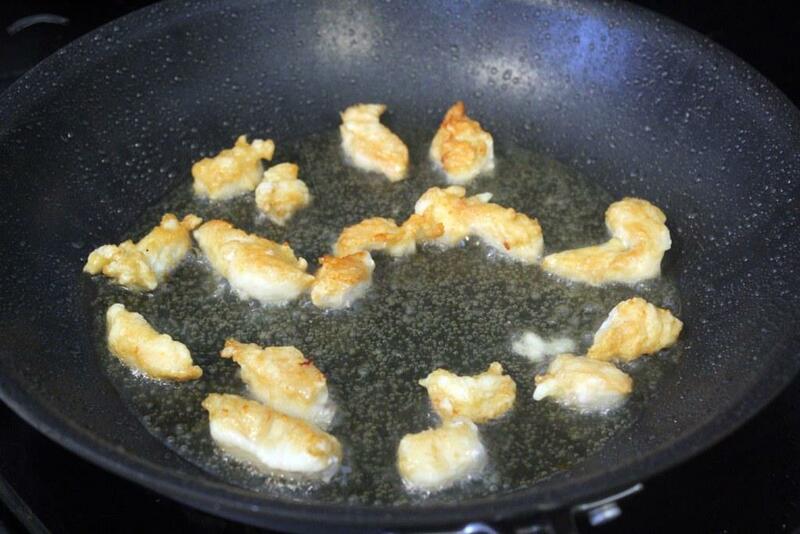 When the chicken is fried, add 1 tablespoon of oil to the same skillet if it seems dry. Add the broccoli and carrots and let cook for 2 minutes. Then add the peppers and onion and let cook for 3 minutes more. Add the garlic and ginger (this can be minced or grated directly in to the pan using a microplane) and stir for one minute until the mixture is fragrant. Add the soy sauce, oyster sauce, and water to the skillet. Stir to combine and reduce by about half. Taste the sauce with a vegetable and add more soy sauce if you'd like. 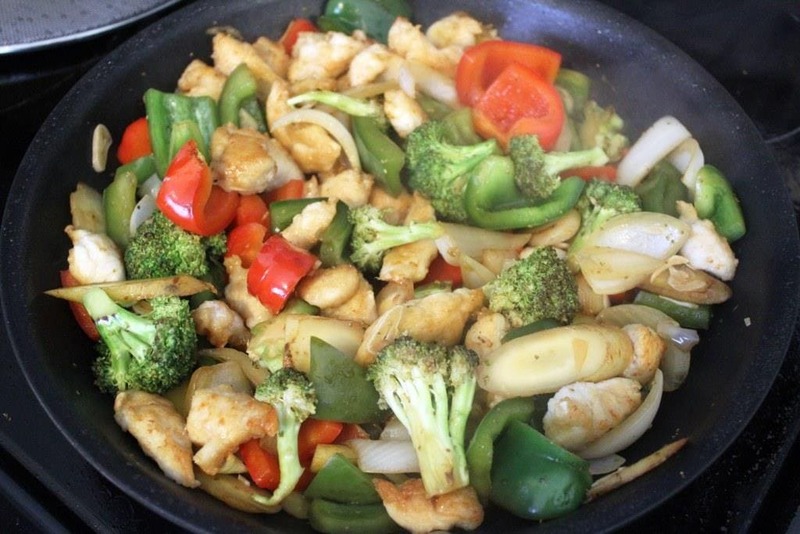 When the veggies are tender but not mushy, add the chicken back to the skillet. Stir together for 1 minute to heat the chicken through. 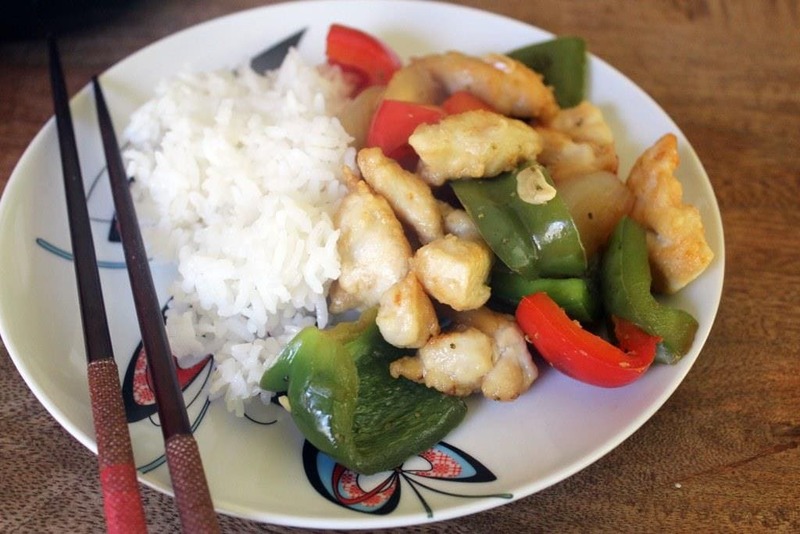 Serve with white rice, if desired.